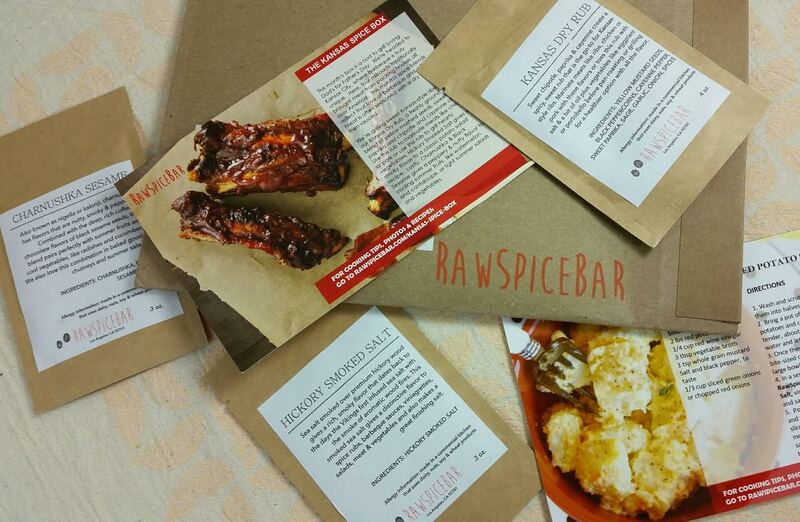 RawSpiceBar sends small packets of freshly roasted and ground spices every month. You'll usually receive three different blends with several recipe cards plus bonus recipes that can be found online. It's a great way to expand your cooking horizons since they can be from anywhere in the world. 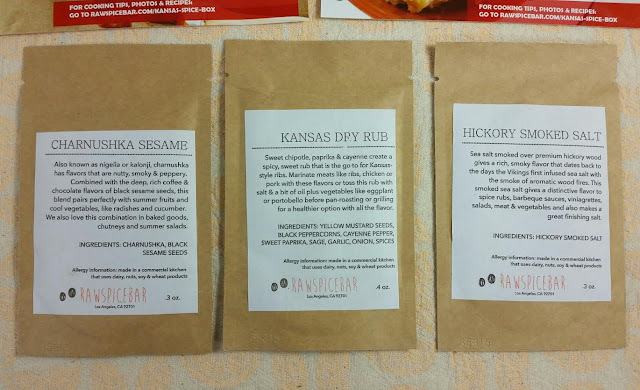 The month of June features spices used in the Kansas City area. Kansas is well known for their BBQ though I have to admit I've never tried it. I think the only time I was in Kansas I was on a road trip and I'm pretty sure we didn't even stop. Flat and brown... Here in Seattle, I'll be honest, we don't really have good barbeque. What You Get: Three spice pouches, which are enough to create 3 individual dishes serving 4-6 people. The total amount of spices will typically weigh between 1-1.5 ounces each month. You'll also receive recipes and cultural tips and notes. 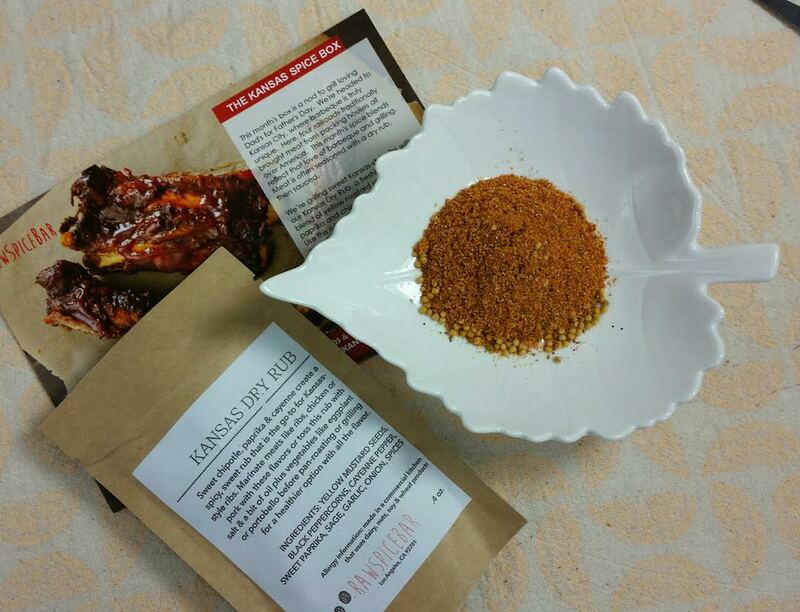 Kansas Dry Rub- This is made with yellow mustard seeds, black peppercorns, cayenne pepper, sweet paprika, sage, garlic, onion and.... spices. I find it so odd when spices is listed as an ingredient in these blends. What could it possibly be that they can't include it? Anyway, this is a rub for ribs, chicken or pork. It's quite spicy in my opinion but definitely flavorful. You can also sprinkle it on eggplant and mushrooms if you are vegetarian. 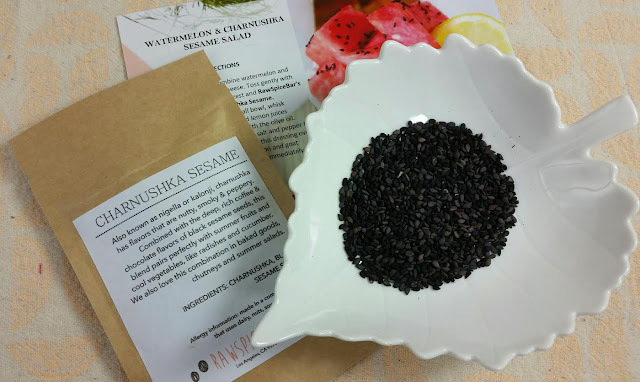 Charnushka Sesame- This is an interesting addition to the Kansas theme. It doesn't fit, really, but I'm glad they included it because Charnushka is a new spice for me. It's a seed of a flower from somewhere in Asia (I guess) but it is used in rye breads, can be substituted for black pepper on veggies like tomatoes and it has a nutty, smoky taste with a hint of anise. It's included in this spice blend whole but they're apparently even better ground up and sprinkled over meats and salads. The recipe included is for Watermelon Salad which looks delicious and I may have to get a watermelon just to try it. 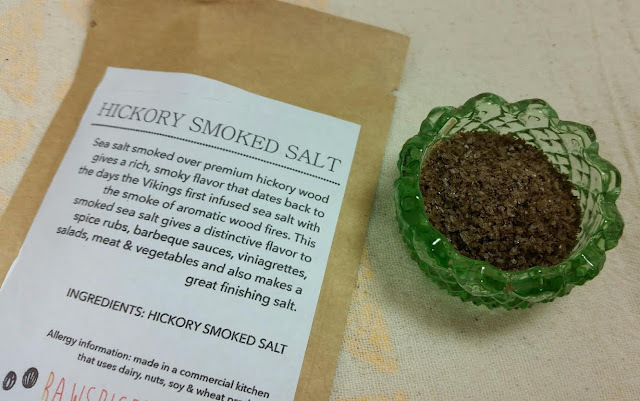 Hickory Smoked Salt- A fragrant, smoky salt that works well in spice rubs on meats, in bbq sauces, sprinkled in salads or just as a finishing salt. I've recently gotten into the world of finishing salts and I'm just sad it took me this long to find out about them. I'm not sure what I'll use this for but I'm not a fan of potato salad so it probably won't be the recipe included. It smells so good it makes my mouth water. VERDICT: RawSpiceBar has changed a lot since it's inception last year. I miss the resealable bags. The spices are portioned for meals for 4-6 people but we don't make meals that large since there are only two of us. They've also changed how much spice you'll receive. It used to be 2-3oz but now it's "typically 1-1.5oz." This month's shipment included only .6oz. The amounts listed on their packets are misleading because they include the weight of the packet itself. I say this so that you will be fully aware of what you are receiving. On the other hand, the spice blends have been very fresh and fragrant and the recipes easy to concoct. I've been led out of my comfort zone more than once and been very surprised by how good the meals have been. The recipe cards are easy to store but the hard part is falling in love with a blend and not being able to get more of it. This month was fun because I learned about charnushka. I've really enjoyed the spices I've received though I have to admit I haven't used them all quite yet. If you would like to sign up for RawSpiceBar, you can do that here. Use code FRESHSPICES for 50% off your first month.